Los Angeles, CA, October 27, 2017 ---- This week sees the release of 10th anniversary editions of Nikki Sixx’s drug-soaked NY Times bestselling memoir, THE HEROIN DIARIES via Gallery Books / Simon & Schuster and SiXX:A.M.’s The Heroin Diaries Soundtrack via Eleven Seven Music. Both packages, released a decade ago, are more timely than ever. As the United States finds itself in the throes of a devastating modern opioid epidemic, Sixx’s recovery advocacy and honesty about the reality of addiction provide a window into the reality of heroin and opioid dependency. The iconic rock artist recently penned a powerful OpEd in the Los Angeles Times and appeared on MSNBC’s “The Beat With Ari Melber” to shed further light on the subject. Sixx has also launched an interactive heatmap, now live at https://www.theheroindiaries10.com, to further the dialogue and shed light on the personal stories of those struggling with addiction. The Heatmap serves as an interactive place where people can pin their locations and share their stories of addiction and recovery. They can share a personal story as part of the diary section (anonymously), read other diary entries, and view the current state of the epidemic in data form. As the creative force behind a multitude of projects, Sixx never stops inventing new ways to express himself and continues to unveil his unusual points of view with new projects. Mediums such as his photography, books, radio shows, TV projects, music and others have given Sixx the ability to fully develop as an artist. Sixx’s first ever photography exhibition, in collaboration with Leica Camera, entitled Conversations with Angels is now on display at Leica Gallery Los Angeles with plans to expand to other cities next year. Proceeds from all sales of Nikki Sixx’s gallery exhibits depicting homelessness will benefit Covenant House California, Los Angeles to raise funds for a photography room & program for Covenant House residents. Sixx will wrap up his #1 syndicated rock iHeartRadio show Sixx Sense with Nikki Sixx December 31, 2017 to focus on new projects including the Broadway adaptation of The Heroin Diaries. Sixx will appear live today in Los Angeles to sign copies of the book and soundtrack at The Grove Barnes & Noble. Details here. THE HEROIN DIARIES: 10th Anniversary Edition Soundtrack by SIXX:A.M features new artwork, personal notes from the band and include 3 newly re-imagined tracks: “Life Is Beautiful 2017”, “Accidents Can Happen 2017”, and Girl With Golden Eyes 2017”. THE HEROIN DIARIES: Ten Year Anniversary Edition by Nikki Sixx features a new cover, never-before-seen photos and exclusive brand new chapters. Trump promised emergency action on the opioid crisis but is yet to do anything about it. 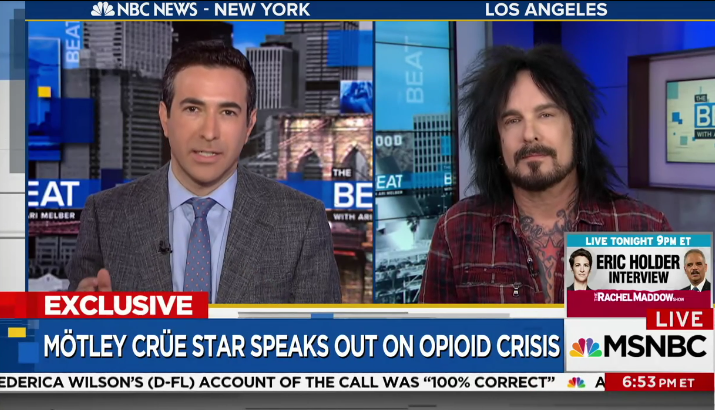 Motley Crue's Nikki Six, a recovering heroine addict, joins The Beat on how to help stop the epidemic. Sep 29, 2017 | 4:00 AM ---- Heroin nearly killed me. As a matter of fact, it did: For two minutes in 1987 I was pronounced clinically dead from an overdose. I was at the Franklin Plaza Apartments in Hollywood, shooting up between snorts of cocaine and shots of booze. It was late December 1987. Mötley Crüe had just released our record "Girls Girls Girls" and we were about to tour the world. From the outside looking in, I was living the dream. But in reality, I was in the throes of a disease I couldn't control, addicted to heroin. I remember very little about that night, but I know someone called an ambulance and saved my life. Today I am 16 years sober and a decade into recovery advocacy. What I've been through doesn't make me a policy expert. But it qualifies me to judge the way the United States is handling its latest addiction crisis: Opioid abuse isn't just making addicts sick, it's making America sick.. The numbers are devastating. The government estimates that 142 people a day die of drug overdoses. ODs are killing more Americans than car crashes and gun homicides combined. Prescription opioids and heroin are the prime contributors to these statistics. Once hooked on prescription painkillers, many users turn to heroin, often cut with more lethal drugs, because it's cheaper and easier to get than another refill. In 2015 (the most recent year for which we have data), there were more than 30,000 opioid overdose deaths nationwide, and the rate is on the rise. Between 2002 and 2013, according to the Centers for Disease Control and Prevention, heroin use in the U.S. more than doubled, and heroin deaths more than quadrupled. Now President Trump wants to slash the 2018 Medicaid budget. He's suggesting deep cuts in funding for treatment, prevention and addiction research. And Atty. Gen. Jeff Sessions wants to fill federal prisons with drug addicts instead of getting them help. Trump makes a show of concern. He convened a commission in March charged with studying the problem, and he has promised to declare opioid addiction a national emergency, which would free up resources for the battle. But he has failed to file the proper paperwork. Instead, he found time to do some name-calling ("I won New Hampshire," he told Mexican President Enrique Peña Nieto, "because New Hampshire is a drug-infested den.") He lies about the causes of the epidemic, blaming Mexico and China when in fact the responsibility belongs to U.S. drug manufacturers and overzealous doctors pushing prescription painkillers. And then there are those budget cuts. Americans are dying. Entire towns are being destroyed. Local economies are crippled by addiction. Yet this epidemic can be stopped, it's solvable. Trump's opioid commission quickly submitted an interim report that spells out the right approach: It emphasizes treatment, education about pain management for doctors, research and data collection, and rational "supply reduction." It spells out policy goals based on facts and science. The president should listen to his own experts. Now. Congress and the administration must approve a 2018 budget that provides sufficient funding for Medicaid. Of the 2 million Americans in treatment for opioid addiction, approximately 30% receive Medicaid. We must not make it harder for the most vulnerable addicts to obtain treatment. Our representatives must guarantee that, in any healthcare reform, addiction will not be not classified as a pre-existing condition that could limit an addict's ability to receive lifesaving care for this disease. The latest failed GOP attempt, the Graham-Cassidy bill, would have harmed those affected by the opioid epidemic through coverage cuts and "flexibility" in what can be covered. Drug manufacturers have to be held accountable for how they market addictive drugs. Many states are trying. In August, South Carolina became the sixth state to sue Purdue Pharma over OxyContin; 41 states have demanded information on the sales practices of opioid makers and distributors. We can better restrain painkiller prescriptions. Pharmaceutical companies are greedy, and the regulations are too lax. Naloxone, a medication that can block the effects of opioids and reverse an overdose in progress, should be widely available, yet — outrageously — a puritanical debate rages over whether access to such a "safety net" encourages drug use. If we fail to take these necessary actions we are saying to addicts, "You aren't worth saving." I am here to tell you that all addicts are worth saving. I am one of the lucky ones. And I know my continuing sobriety is not the result of my actions alone. I have a loving family and an extensive support network.. I have AA and the guidance of my sponsors. I have good health insurance. I have the money, time and resources to help me save myself. So many people don't have access to these resources. But they are no less deserving of help. No one is a junkie by choice. And no junkie is a lost cause. Addiction cannot be solved behind closed doors. It's a sickness, a systemic failure and a societal problem. Individuals are responsible for their own recovery, but too often, we struggle and suffer — as we sin — in secrecy and silence. Secrecy and silence do not lead to solutions. So I am speaking out. And so should you. Because another 142 people are going to die today. Nikki Sixx is the co-founder of the band Mötley Crüe. An updated, 10-year anniversary edition of his memoir and Sixx:A.M. soundtrack "The Heroin Diaries" will be released in October. His photo exhibition "Conversations with Angels" opens Oct. 4 at the Leica Gallery Los Angeles. Stream We Will Not Go Quietly Now!